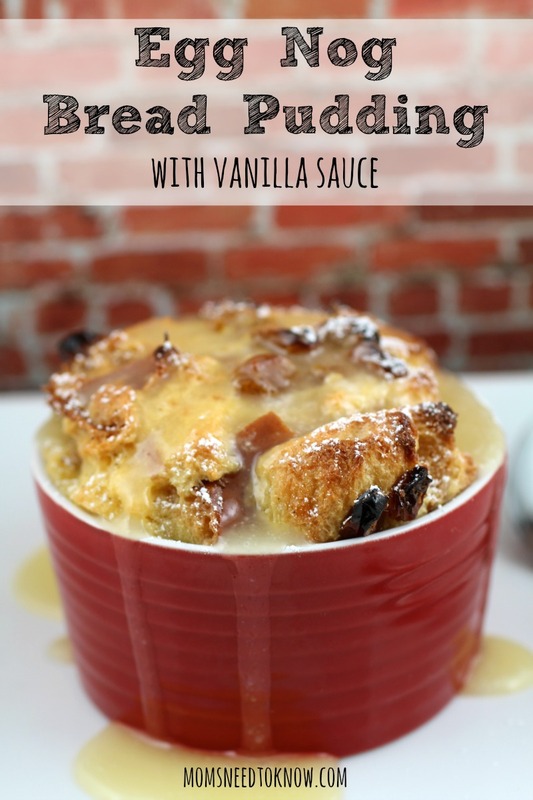 This eggnog bread pudding recipe is a completely decadent way to enjoy the flavors of the season. Be sure to pair it with my homemade vanilla sauce! In another bowl, whisk together all other ingredients except the raisins. Pour mixture over bread cubes and stir to combine. Allow mixture to sit for 10 - 15 minutes, stirring often until most of the liquid is absorbed in the to bread. Spoon mixture in to prepared ramekins or baking dish. Place ramekins (or baking dish) on a cookie sheet and place in the oven. Cook for about 40 - 45 minutes (50 - 55 minutes if using a baking dish) until pudding is completely set and starting to brown on the top. Combine all ingredients except vanilla in saucepan or non-stick skillet.